Why is an Orthopedic Surgeon talking to you about neurodegenerative disorders such as Alzheimer’s Disease? Stay tuned; this is another post in our Live Better series which will be a major theme here in 2019. This series will focus on longevity, healthspan, and improving your knowledge of the ways we might be able to slow the aging process and remain active longer. Alzheimer’s disease (AD) is a devastating form of neurocognitive decline. AD is not the only form of dementia, but it is the most prevalent. In general, dementia means that a person has diminished short term memory capacity, facial identification issues, difficulty processing or encoding new memories, depression, agitation, behavioral changes, and in the end, difficulty with activities of daily living. 80% of us will die from cardiovascular disease, stroke, cancer or a progressive neurodegenerative issue such as AD. But if you speak to people, it is clear that AD scares them the most. Dementia is so prevalent that almost everyone knows someone close to them who are suffering from AD or other advanced forms of neurocognitive decline. The actual number of people who die from Alzheimer’s isn’t known. That’s because people with Alzheimer’s die from something that was caused by their AD, but AD was not listed as their cause of death. For example, a person with severe AD may not complain of pain, yet there is an obstruction in their intestine. The blockage might ultimately lead to their demise, but it was the AD that prevented them from communicating promptly that they were in pain. Thus, issues such as a bowel obstruction are picked up far too late to be cured. Alzheimer’s disease is pathologically characterized by a collection of waste products (Beta-amyloid) and sticky proteins in the brain. These proteins are either over-produced or not cleared by the brain’s microglial trash collecting system. The resulting tangles of amyloid and protein start to clog critical pathways and ultimately leads to the destruction of nerve cells and atrophy of portions of the brain itself. For decades research has focused, and continues to focus on elimination of Beta-Amyloid and these sticky proteins. Unfortunately, 99.5% of all medications produced to treat AD in its advanced form have failed. Is it because these researchers are focusing too much of their effort on the end result, and not the actual cause(s) of AD? In 2019 most physicians treat patients just like they did back in the 1940s and the early era of antibiotics. At that time, patients came to the office with a specific problem such as an infection. They were given a prescription for antibiotics, and they were off until their next illness. We didn’t know much about many disease pathways or how genetics would play a role. We certainly didn’t know how many issues are tied together in interact in very complex packages within our body. Humans are highly complex beings. Many of the functions that our DNA codes for, and many of the interactions between our gut bacteria, liver, muscle, brain and heart functions have only recently been elucidated. Over the next few years, researchers will have supplements or medications and targeted therapeutics that will improve our healthspan meaningfully. As an Orthopedic Surgeon, I treat many aging athletes and many older folks who want to remain active longer. 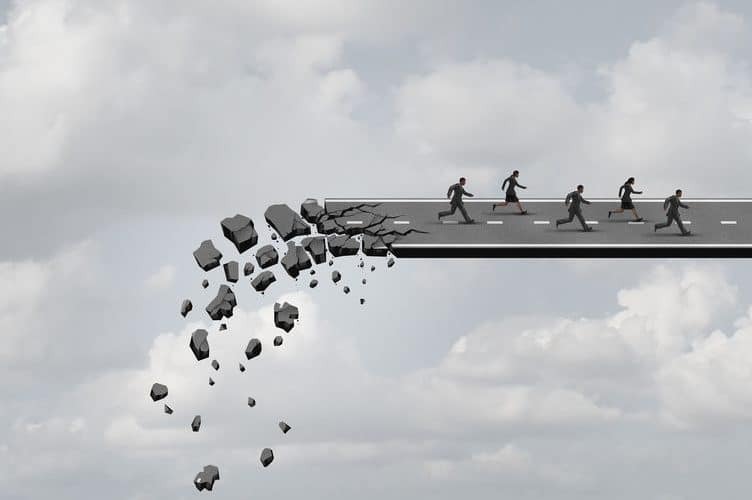 There has to be a tipping point where we as “specialists” start to step outside of our ever-present comfort zones and help you, our patients, understand the nature of human complexity with the goal of longevity, and pushing off the onset of chronic disease. The healthcare system challenges providers and limits their desire to learn more than we were taught in medical school about subjects outside our comfort zone or specialty. I intend to step outside that comfort zone. Truth be told, this Orthopedic Surgeon who is an expert in Sports Medicine is now a 55-year-old endurance runner and amateur cyclist. I am humbled that I get to care for you and your salient sports injuries or arthritis. I am fascinated by the study of aging, longevity and the concept of improving our healthspan. That translates into me being able to remain active longer. That means that I need to focus my efforts on holding off the onset of chronic disease for 10-15 years longer than our current lifespan curve predicts. I’m not selfish in my efforts. I want to share this information with you in a way that I hope is easy to understand, and easy to incorporate into your plan to live better. Check out the curve below. My goal is to “square-off” the lifespan curve. 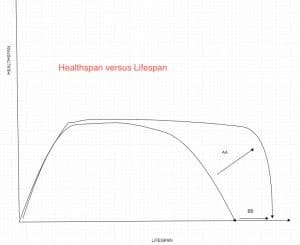 In the graph below that means moving the curve out along the line “AA.” If all goes to plan, we can kick the chronic disease can ten years down the road. It’s not appealing to me to live longer if I’m living with doctors appointments each week, open heart surgery, six medications and I’m unable to get up from the floor if I fall. Centenarians (folks who live to 100) follow the upper healthspan curve. They remain active, relatively disease free and cognitively intact well into their late 90s and then they rapidly deteriorate or die in their sleep. That sounds far more appealing to me. As of 2019, we can not prevent all cases of AD. What we are learning is that we are able to reduce your risk of developing AD. Scientists are learning how to delay the onset of AD. Some forms of dementia may be preventable, especially those associated with vascular disease. Alzheimer’s is often referred to as Type 3 Diabetes in some circles, but this has not been widely accepted. Like Type 2 Diabetes, many cases of AD (up to 1/3) may turn out to be preventable. Diabetes affects every tissue in your body. The brain is no different. Some feel that a number of AD sufferers developed AD due to an underlying issue with insulin resistance. We know that Type 2 Diabetes has to do with insulin resistance in your cells. Due to chronic sugar and simple carbohydrate overload, the cells become unable to take in glucose in response to the presence of insulin. That raises the amount of insulin the pancreas makes as it tries to help your body lower its glucose levels. After a while, the pancreas burns out and can no longer push out the excessive amounts of insulin your body needs to get the glucose from the blood into cells. Many researchers believe that this is a contributing mechanism to the development of Alzheimer’s Disease. Down below I will go through the current strategies thought to adjust your risk for developing AD. In its most basic form, the causes of AD can be due to vascular (poor condition, diabetes), genetic, environmental (toxin), lifestyle (diet, lack of exercise), and hormonal (more common in women who are perimenopausal) issues. The potential contributors to the onset of AD are numerous. Some of the causes of AD are under our control. Other causes are not. There are familial or genetic forms of AD. There are two genes ( presenilin 1 and 2) that a very small percentage of people have. Carriers of Presenilin 1 or 2 may develop AD at a very young age. All of us have genes that code for a protein called ApoE. But there are different variants of the ApoE gene. The protein ApoE is involved in how our body handles cholesterol and lipids. Because there are different variants of the ApoE protein, there are different ApoE phenotypes. A phenotype represents how your DNA code expresses itself in you as an individual. Specific ApoE proteins types carry a higher risk of developing Alzheimer’s, atherosclerosis, coronary artery disease, and stroke. Certain ApoE variants raise your risk for developing AD, but some of those risks are modifiable. Keep reading… I’ll get to that soon. Homocysteine and other “biomarkers” (maybe in Uric Acid too) may reveal an elevated risk of developing AD. Our lifestyle choices are increasingly being recognized as the most common modifiable risk factors for developing AD. Depending on how you look at it, this can be good, or bad. I hope that this little nudge will get you to make better lifestyle choices to diminish the burden of chronic disease in our society. The bigger the belly, the smaller the brain. Sounds crude, but the overall concept is that visceral fat or the fat within your belly is metabolically active and wreaks havoc on our metabolism. Visceral fat increases our systemic inflammation, and its presence strongly associates with the development of heart disease, stroke, type 2 diabetes, and AD. Your overall risk of developing AD will depend on your genetic phenotype AND your lifestyle choices. Treatment Strategies: Can We Prevent The Onset of Alzheimer’s Dementia? As researchers continue to unravel the intricacies of AD and other forms of dementia, many different potential treatment modalities are emerging. Preventing or delaying the onset of AD requires a understanding of the risk factors and a methodical approach towards prevention. It will involve incorporating a lot of information to determine your risk profile. We cannot change your DNA code, but intense work is being done to come up with substances or medications that will limit the risk brought on by your genetic code. The ApoE proteins are a target of significant spending and research right now. Being able to manipulate their expression, or their downstream effects will modify our risk for heart disease, stroke and many cases of Alzheimer’s Dementia. Certain biomarkers can determine your risk from an inflammatory or metabolic perspective. Biomarkers give us a clue as to how your body is handling glucose, stress, epigenetic related lipid levels (like HDL, LDL), etc. As of today, the only proven intervention to decrease your risk of developing AD is exercise. Yes, exercise. Like many other chronic diseases, exercise has dramatic effects on our DNA, and our metabolism. It improves our insulin sensitivity, improves our muscle mass, decreases our risk of frailty, and falls. Insulin resistance appears to have a role in the development of AD. If you think of your risk of developing AD in much the same way as your risk of developing other vascular issues such as cardiac disease and stroke, then the impetus to get up, make your day harder, and exercise more hopefully grows stronger. When you get deep down into the weeds, exercise improves your insulin sensitivity, you will activate genes that are protective, you decrease inflammatory mediators that contribute to vascular disease, you improve your cardio-respiratory status and improve your odds of living a healthier life. Both aerobic and resistance exercise are important. Muscle mass is predictive of a longer healthspan. Aerobic exercise is critical for other healthspan related improvements such as protecting your DNA code. AD Researchers are studying various anti-inflammatory supplements such as TheraCumin (curcumin that is more easily absorbed). Early studies show that Curcumin may be protective, may improve memory and may minimize early symptoms. Omega3 fatty acids and DHA may also have a role in AD risk reduction. There are studies that show some benefit, and others that do not. One issue is that it may take years for Omega 3 intake to adjust the relative concentrations in the brain. Therefore, six-month studies will not show a benefit. Longer trials and experiments are necessary. Blueberries and potentially the Anthrocyanin found within them may hold promise as an anti-oxidant. But taking anti-oxidants needs to be balanced with the risk of taking them in other disease states. Statins may or may not have a role in risk reduction for developing AD. In people with certain ApoE proteins, statins might actually make the problem worse. Science is complicated. As I mention down below, the website Alzheimers Universe lists the centers around the country that are focusing on precision management for those of you at high risk of developing AD. High risk is considered someone who has AD in their immediate family. But anyone with a brain is at risk for developing AD :-(. Vitamin B may have a role if your Homocysteine levels are high. Again, no one treatment path will work for everyone. See an expert, assess your risk, and define a prevention strategy that works for you. As discussed in Dr. Attia’s podcast on the subject, knowledge is power. Know your numbers: Blood pressure, resting pulse, Inflammation, lipids, fasting glucose, fasting insulin; adjust and reassess. Again, this requires expertise and a medical team willing to help. Optimizing sleep is critical. Proper sleep is an extraordinarily important part of being healthy. Proper sleep has many enemies in our busy, lit up, online crazy world. In order to sleep well, you will need to manage stress well. I strongly suggest you look into the Waking Up course by Sam Harris. There are many different sleep trackers on the market. They will give you a better understanding of how you are sleeping. Hacking your sleep cycle can significantly improve your emotional and physical health. Understanding Alzheimer’s Disease and your risk is technically challenging. I suggest that you visit the Alzheimer’s Universe website if you are concerned about your risk of developing AD. I am NOT suggesting that you start taking any of the supplements mentioned. Precision medicine, or targeting issues that are unique to you because of genetic issues and other contributing factors is the key in delaying the onset of AD in at-risk people. There are nearly 15 labs across the country which are taking very deep dives into the lives of those at high risk. Those are the professionals who may be able to determine if supplements or other risk mitigation strategies are in your best interest. Until you chose to do so, take this as another nudge to commit to exercise more. Again, exercise is the only proven way to decrease brain amyloid and adjust your risk of developing AD and other contributors to a poor healthspan. Running. Back to Basics. Base Building. ← Does Running Have Anti-Aging Benefits?